Support a climbing plant or add fun style to an outdoor wall using the Gardman Premium Tube Trellis. The two half round units bring surprising texture to a wall, and their possible uses are endless. Stack one trellis atop the second and place them against a wall to camouflage a drain pipe, or combine them to create a dynamic 8" diameter tube trellis surrounding a tree or lamp post. Use these items as traditional trellises against a wall, or situate them above climbing plants or vegetables for a hearty support. The green, plastic coated finish helps these pieces blend with the outdoors, while eyehooks at each corner make combining and installing them with hardware simple. 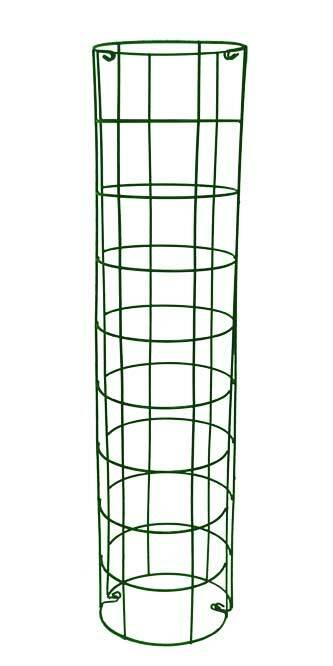 Create a unique look in your garden or landscaping with this Premium Tube Trellis. Rail Dimensions: round rails, 0.125" dia.